We know there’s always a little hair in our lives, but sometimes there’s hair in places we don’t want it, and shaving just doesn’t do enough to eliminate it. Perhaps it’s not so much the hair itself, but that your normal methods are unsightly and irritate the skin (razor bumps and angry follicles) or messy (waxing or hair removal creams). Wouldn’t it be great to have a way to remove all that hair without the irritation or mess? Or even better, to only have to remove it once and be done with it? This is where laser hair removal comes in, a painless, noninvasive method of dealing with unwanted body hair that can permanently remove or reduce unwanted hair. This method of removing hair can leave your skin feeling smoother and more luxurious than waxing or shaving, and thanks to how gentle the process is it can be used to treat large areas with ease. These are just some of the reasons that laser hair removal is one of the most frequently performed cosmetic procedures in the US. Self-consciousness brought on by unwanted hair on the face or body. Feeling like your clothing choice is limited due to the amount of hair in certain areas of the body. If you have exceptionally dark hair and light skin, making the hair prominent. Sensitivity to hair-removal creams, bleaches, or waxing materials. 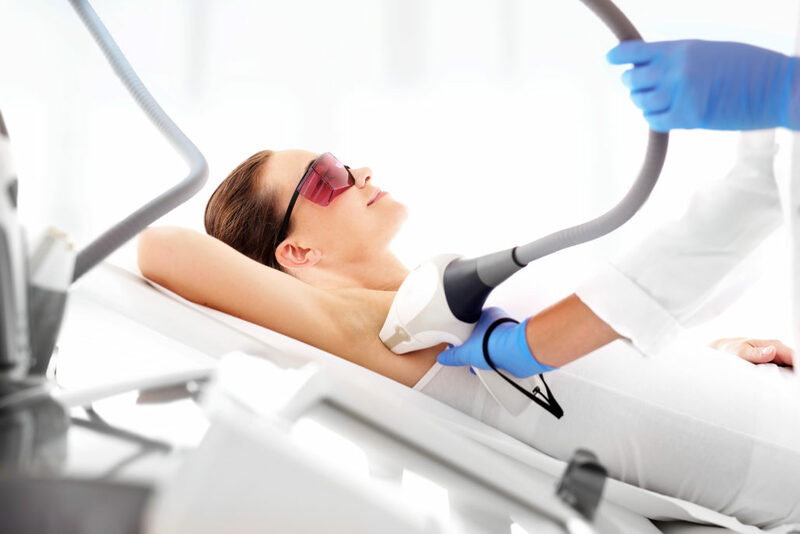 These are just some of the reasons people may choose to have laser hair removal performed. Appropriate for any size body area. Can aid in easing skin blemishes by making your complexion more even. Permanent hair loss can occur after just 3 sessions, or as many as 8. Satisfactory results usually only occur after multiple treatments. Darker skinned patients see reduced benefits due to a lack of variance between skin and hair color. Lighter colored hair responds poorly as a result of a lack of pigment. During a laser hair removal procedure, a cooling gel is placed on your skin, and your eyes will be covered with protective lenses. A low-energy laser is then calibrated for your hair and skin color and is passed over the target area. The energy from the laser is absorbed by your hair and transmitted to your follicles, disabling hair growth. If you think laser hair removal may be right for you, consult your aesthetician or a local laser hair removal clinic. A beautiful future free of unsightly, unwanted hair lay ahead!